Marseille is the oldest city of France and it’s also called « The Door to the Orient ». This city has been cosmopolitan and open to the Mediterranean Sea and to the world since it’s foundation. Eurocircle, in partnership with Eurasianet choose to highlight this inheritance, with the project SmarT’seille! The goals of this project are to value and to strengthen the numerous partnership agreements developed by the city in the whole world. This international and intercultural cooperation is effective through the youngsters, called « Ambassadors of interculturality ». Eight of them are from Marseille and they will go to different destinations like Montreal (Canada), Tokyo (Japan), Glasgow (United Kingdom), Barcelona (Spain) and Erevan (Armenia), to work on public missions and to be a representative and spokesperson of Marseille. On the other hand, Marseille is hosting two youngsters from Glasgow and Barcelona who will work for the City and represent their city and their culture to the youngsters of Marseille. These international volunteering missions are a benefit to the youngsters and to the hosting cities. First of all, it is a great occasion to experience mobility abroad. It enriches the volunteers in the professional, cultural and human aspects. For the hosting cities, it is a way to take advantage of the dynamism and the new ideas of the young foreigners in the frame of their commitment in the local structure. Widely, the meetings between the people from the city and the youngsters from other countries are the best way to raise awareness among the people to international mobility and to cultural openness. 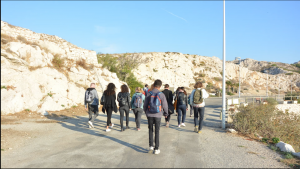 This project started in September 2017 and the launch was on the 18th of October with the young participants, but also representatives of hosting and sending organizations in Marseille such as Eurocircle, Eurasianet, Une Terre culturelle, Hors Pistes and Parcours le monde. 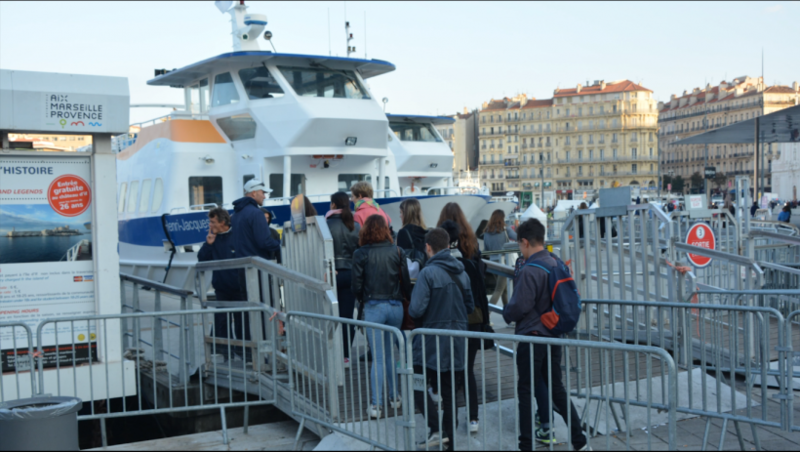 The schedule of the day was: discovery of the historical, cultural and natural heritage of Marseille with an excursion on the emblematic Frioul islands. The volunteers from Marseille or abroad benefited from unusual viewpoints of Marseille from the sea and were also made aware of the historical and natural wealth, considered as global heritage by the UNESCO. This day has been a way for the volunteers to present themselves, to exchange about their country and their volunteering missions. With a typical aïoli meat shared for lunch! Finally, to cloture these joyful moments, the youngsters were invited at an official reception with the Mayor of Marseille, in the beautiful ceremony room of the Mairie. During the oration volunteers were encouraged and given trust by the Mayor and the consuls of the hosting countries. We hope that this launch day, full of exchanges, discoveries and meetings will be just like what the volunteers of this project will experience, and that SmarT’seille becomes a project of international cooperation in the long term.